I Thought Submarines Were SUPPOSED To Sink? The above is a computer image of the new Spanish Navy submarine, the S-80. 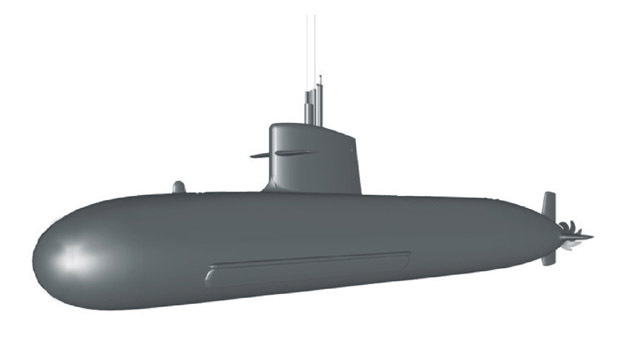 It is billed as the most advanced submarine on the planet, due in large part to the innovative Air Independent Propulsion system incorporated in the design. Now it appears that Spain’s newest additions will all too readily sink, which is what submarines do. The problem is that they might not be able to come back up again. Somehow, in some mysterious fashion, an extra 75 to 100 tons of unexpected weight was added to the design. The submarine will have to be lengthened in order to displace enough seawater to support the increased mass. This will increase the costs per unit considerably, as well as push the delivery date farther in the future. The S-80 project has already proven to be problematic. The original cost estimate was for $550 million USD per boat, but this has ballooned to a bit more than $700 million USD. The first boat was to be delivered in 2011, but political delays pushed that to this year. The redesign to lengthen the hull will probably mean that the first S-80 to face sea trials will get wet in 2017. This might seem to be a poorly run project, but problems like these are actually par for the course when new weapon systems are first introduced. Defense contractors routinely “front end” their cost estimates when pitching new projects to the politicians. This means that they initially request a budget that will work only if everything goes perfectly smoothly and there are no snags, setbacks, or surprises during design and construction. Everyone knows that there are always surprises, but they count on the fact that politicians are reluctant to cancel a project after a great deal of money has already been spent in the fear that the waste would be used against them at the next election. And don’t forget that we are talking about highly complex systems put together in novel ways. No matter how good the engineers are, no matter how much time they spend crunching numbers and peering at the computer screen, no one knows what will happen until they get down to the shipyard and start building the thing. Bottom line is that cost overruns and last minute design additions are business as usual. It certainly doesn’t mean that Spain has a lemon on their hands. If they’re lengthening it without changing the height and width, that is another problem. There’s an ideal shape for a submarine hull, which has maximum hydrodynamic efficiency. That’s why the Ohio’s are so massive: they had to be a certain height to carry the missiles, and that dictated the width and length. Subs which don’t have this idea shape are less efficient moving through the water, and they’re more noisy because of turbulence. The first mistake the Spanish Armada made was to get in bed with the French manufacturers. The second mistake was to break up with the French manufacturers – there went the expertise. They’re gonna have to go over to Groton, CT, and beg the boys at Electric Boat to come over and fixt it.